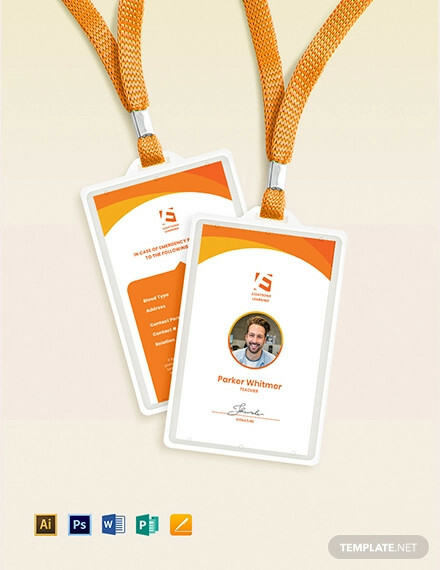 When we go to school, to work, or any other place that requires person-to-person interaction, identification cards are very important instruments used to let other people know who you are without having to introduce yourself over and over again. 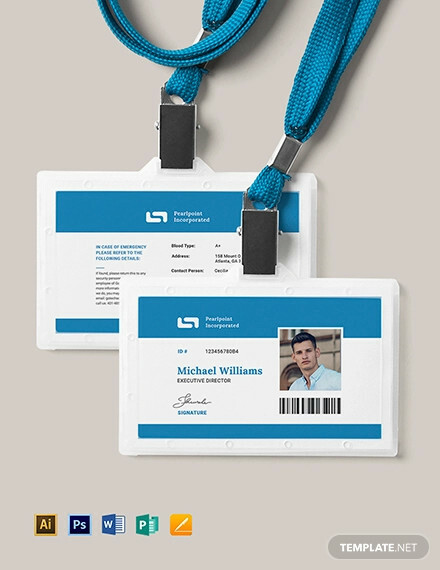 For students and workers alike, ID cards can help others identify not only their name, but also the school they are studying in and the company they are working for, respectively. All of us have heard of the saying “No ID, No Entry” in schools, which only proves that identification cards are indeed necessary when going to institutions. 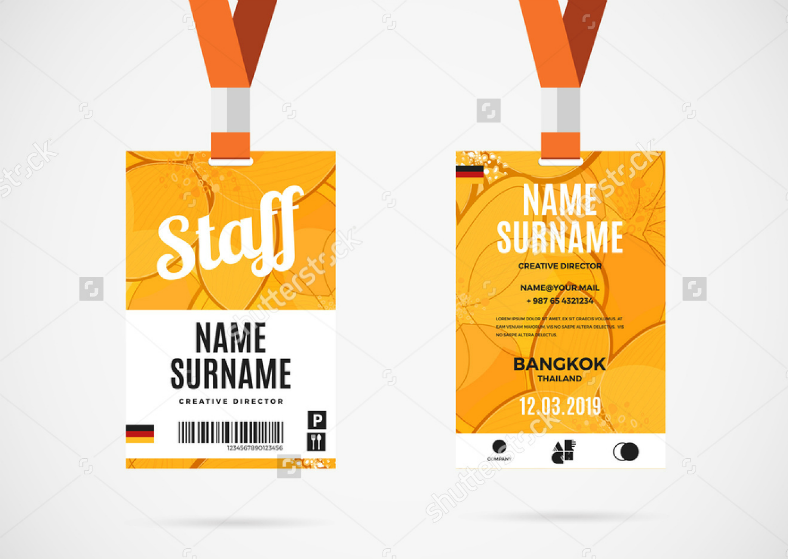 We are offering you more than eight of the best editable identification card designs that you can download and use for various purposes. Check out the various samples below and pick one that you think suits your purpose. 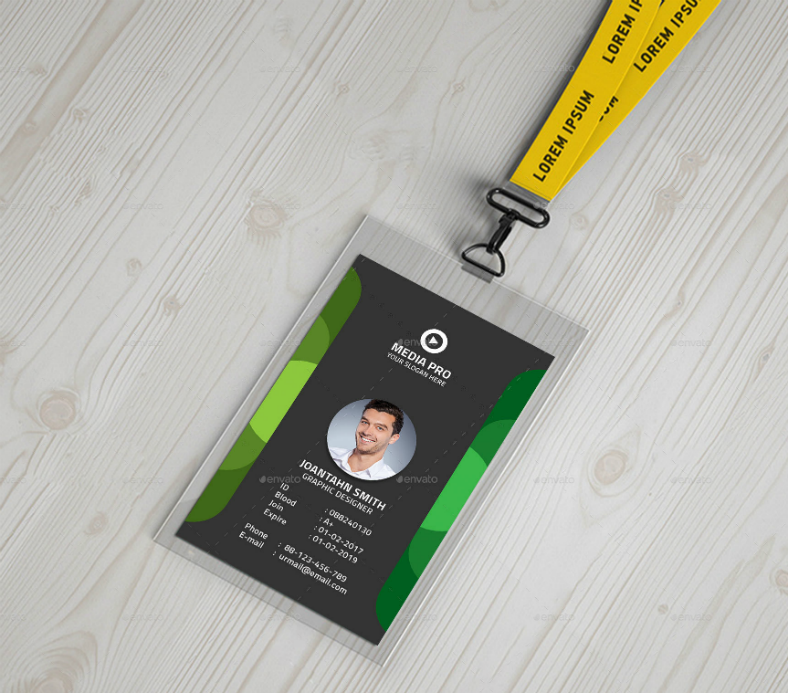 For a simple ID card design in PSD that enables you to focus on the more important attributes such as the name and the designation of the wearer, this one is a safe choice. The artistic features are kept to a minimum and are only found on the sides to prevent you from diverting your attention to unnecessary details. On the back portion of this card design is a QR code which can be used to open the company’s website when scanned. It could also lead to an online profile of the employee. 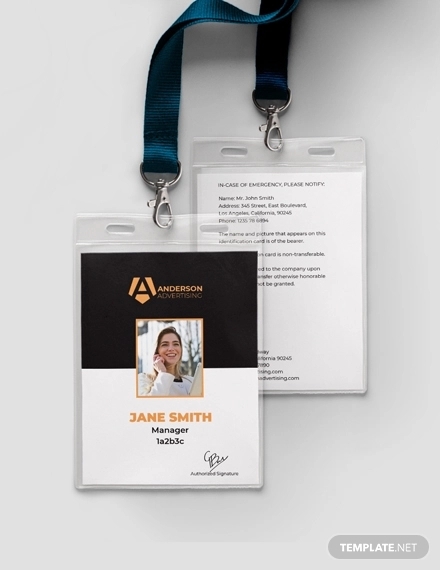 This identification card design can also be used as a business card if you choose to have multiple copies printed and then distributed to prospects. 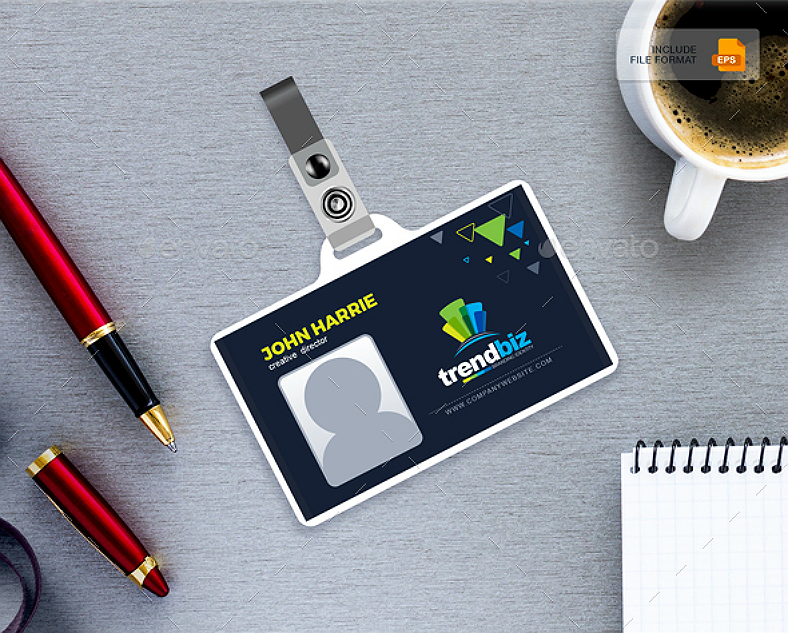 For it to work as an ID card, you can either have it printed on a hard plastic card. 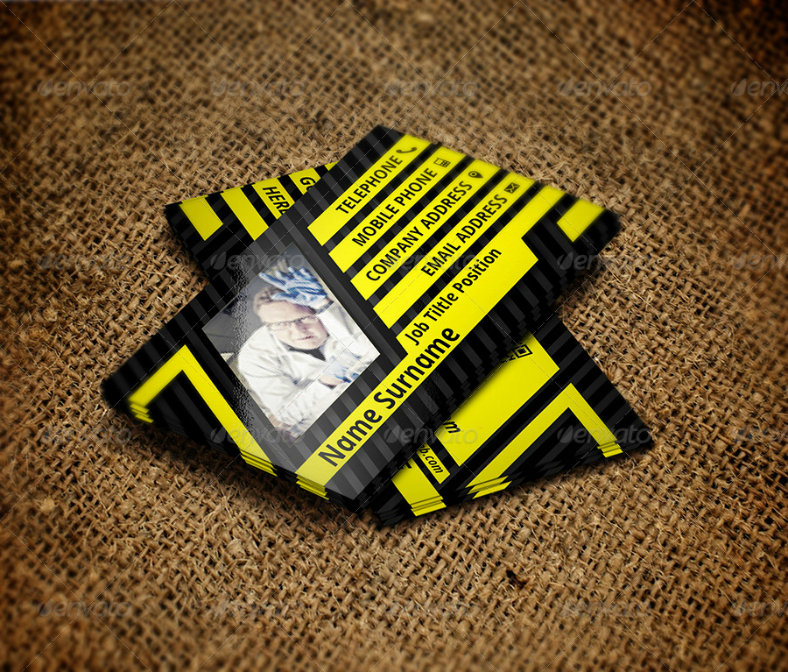 If you insist on printing it on card stock or thick paper, you can have it laminated or placed inside a card case. 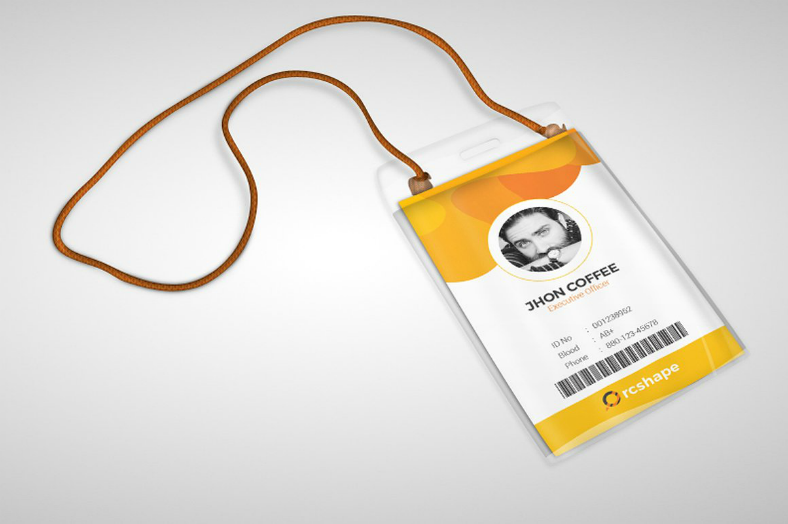 Choose this identification card design if you prefer a more simple look for your ID’s. This layout is not overly simple that it appears dull. 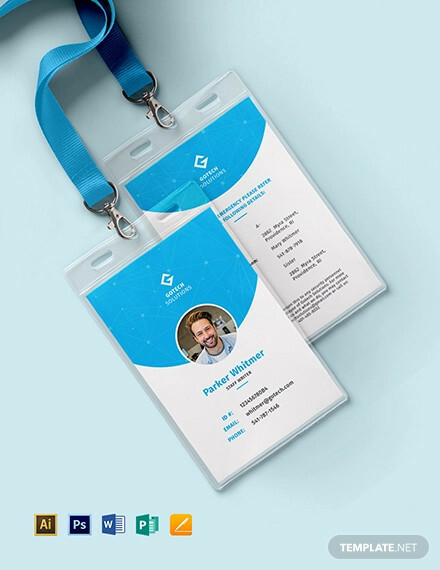 While the upper half of this design makes use of a light-colored textured background, the lower half maximizes the use of white space by leaving it blank. 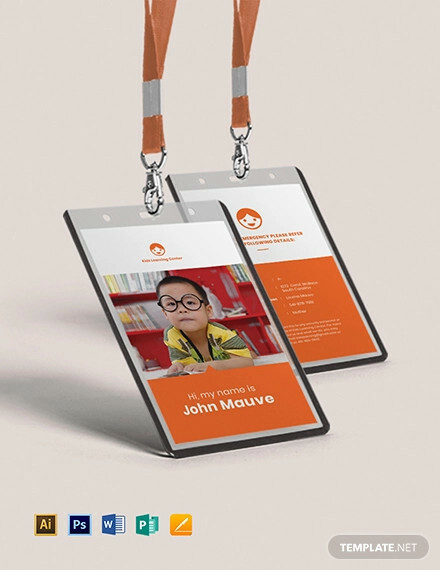 This way, the attention is focused on the name and designation of the wearer while also keeping the design easy on the eyes. 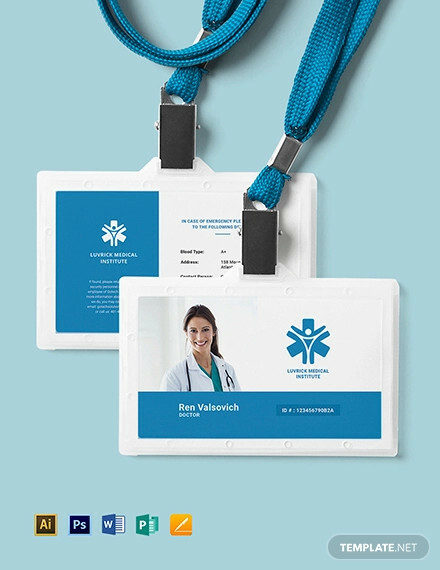 Heath care providers will need to maintain wearing an identification card when for them to be distinguished from other departments. 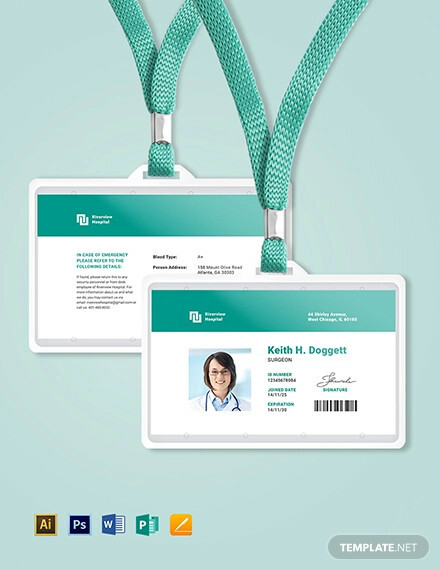 Hospitals are divided into various departments, with each of them functioning differently from others, which is why ID’s are important to guide patients and clients on who to consult for problems. For example, if anyone has any problem related to medicines, they will need to approach the staff from the pharmacy department. When organizing an event, head organizers need to keep track of the workers and volunteers. They will need to have temporary identification cards or a name tag, as some may call it. 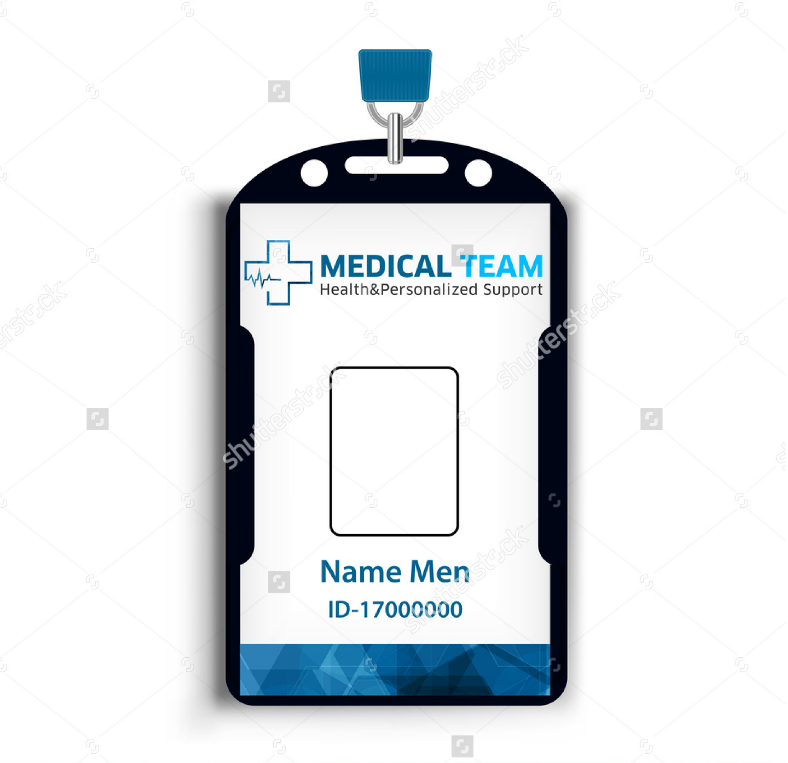 The picture of the staff is usually not necessary, but if they require it, they can ask the ID wearer to use their personal photo and paste it on the card. 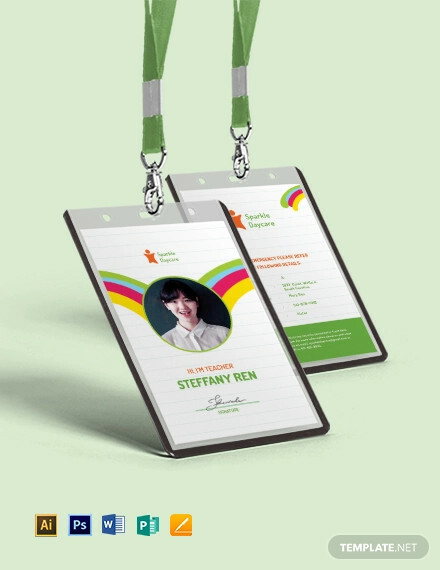 This type of ID card are usually disposable and are discarded once the event is finished. 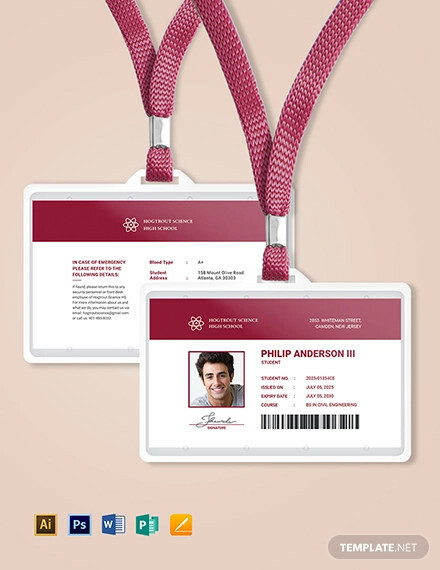 Where can Identification Cards be Used? 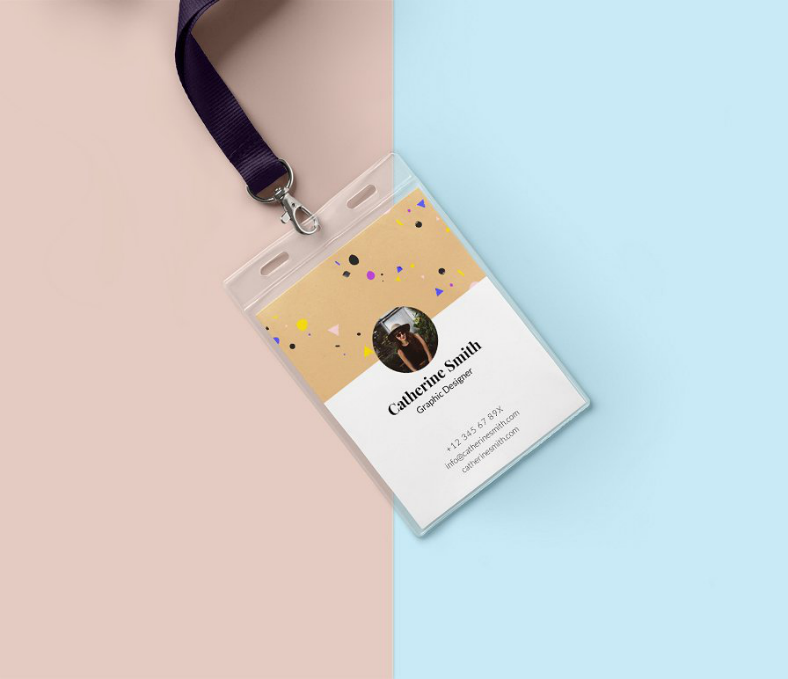 From the identification card designs that we have shown you, you can select one from among the list that you need for whatever purpose it may be. But where can we actually use ID cards? Schools and colleges. 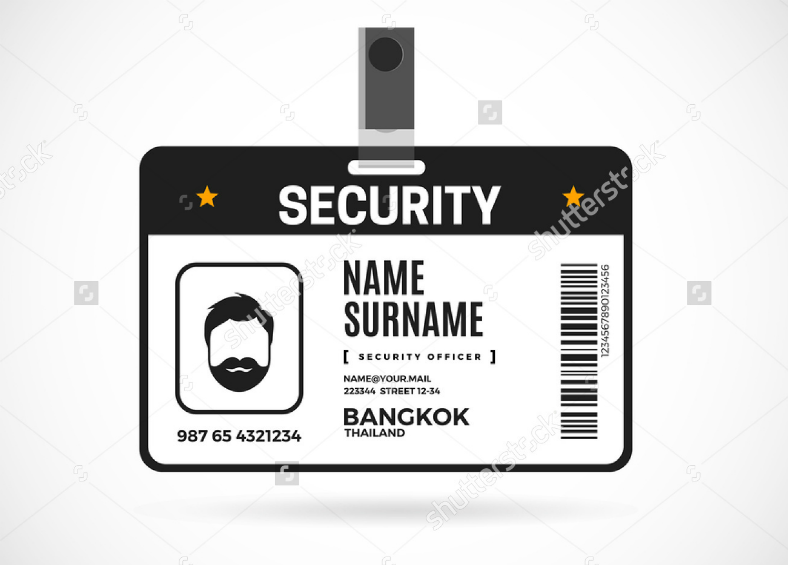 Students need to present their ID’s to the security personnel when entering the educational institution for proof that they are indeed enrolled there. Once a student finishes school, they will need to surrender their ID but can still avail for a alumnus ID to identify themselves as a former student in that school. Offices. 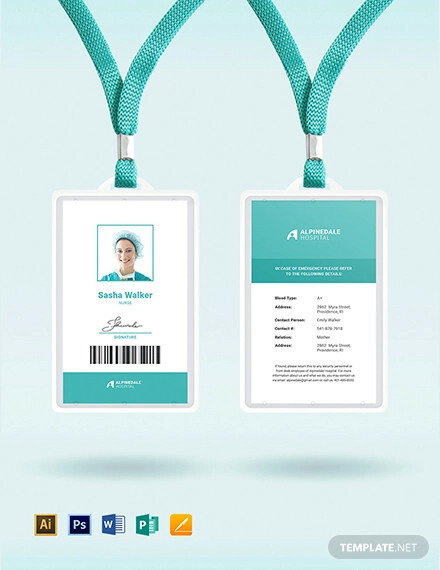 Office workers will have to keep wearing their ID’s, either by a clip or a lanyard, for them be recognized not only by their name, but also by their position and the specific department that they are assigned to. In events. This is especially applicable when there are a lot of staff responsible in organizing an event. Their ID’s or name cards are useful when tasks are being delegated to keep track on “who” is assigned to work on “what”. Government services. When we enroll ourselves to certain services offered by our government, we are able to avail of their benefits when we present our ID’s to affiliated establishments. Licensing. To drive vehicles legally, we would need to possess a driver’s license, the same way that we will also need a license to be able to own a firearm.